We went to Houston, Texas and spent July 4th weekend there and my family made Korean BBQ for us to eat.. I fell in love with the H Mart and the food that they sell there. 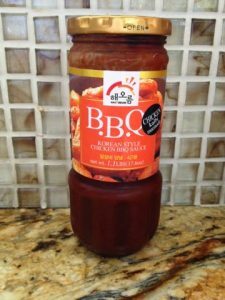 There is this marinate that they have there that I LOVE and they use it to marinate their chicken. I bought 1 bottle to try. 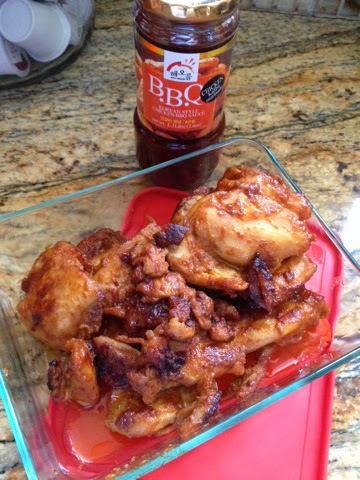 Here is my copycat version… It was so GOOD!!! ***If you can grill it..would be the BEST!! Preheat an outdoor grill for medium-high heat. 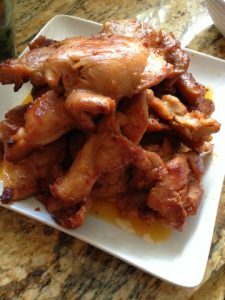 Place the chicken thigh on the grill with at least 1/2 inch of space between them. Close the lid and cook the chicken for 4 to 5 minutes. Raise the lid and turn the chicken thigh. Cook an additional 4 to 5 minutes. Take off the grill and serve immediately. If you are cooking the chicken on the stove. Heat another teaspoon of olive oil in a medium skillet over medium heat, place chicken thigh in and cook until edges are opaque, about 10 minutes. Serve with Jasmine rice and Kim Chi if you have some…if not some sliced cucumber is just as good. Simple but DELICIOUS!! You can also serve it in a vermicelli bowl with prepared fish sauce with some herbs and pickle carrots and daikon.